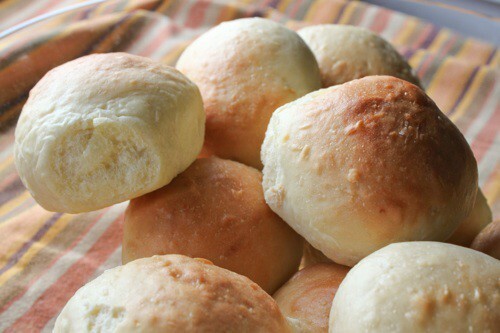 Dinner Rolls Recipe | Good. Food. Stories. “Starting from scratch” is a phrase that often connotes a plan that failed, a misguided project in need of a system reboot. Something went wrong and you’re taking a mental sweep of the hand across the table to clear it off and do it right this time. For those of us who cook as stress release, for whom a meal isn’t just a mindless few minutes of satisfaction but a source of therapy, starting from scratch is an exercise in Zen. Laying your mise en place out on the counter, immersing yourself in the repetition of chopping, measuring, stirring, tasting, assessing; it’s a calming sensation that’s ripe with potential as you shape a dish into being. And in a week where nearly everything went pear-shaped (such a lovely British term for such an unfortunate turn of events), starting from scratch was the only way to go. It began with inadvertent self-injury, as in the span of three days I made myself .001 pounds lighter by slicing off part of my thumb on a food processor blade. Then burnt my arm while roasting 22 pounds of cashews. Then hit myself square in the forehead with an All-Clad saucepan (yes, it’s possible—don’t try this at home). Unpleasant, but nothing I couldn’t bandage up and move on. Then the heavy, less-immediately-bandageable stuff came down. ReadyMade announced it was folding (final issue on stands now, website closure soon) and almost just as heartbreaking, Big Man Clarence Clemons played his final gig. Needing to regain some equilibrium, I realized it was time to take a cue from what turned out to be my final piece for ReadyMade, published this week: a treatise on the easy (yes, easy, I swear!) skill of making pie crust based on a two-day intensive baking seminar at King Arthur Flour in Norwich, Vermont. At Blog & Bake, a session pulled together by the incomparable Allison Furbish as a baking boot camp for food writers, 12 of us were put through our paces in bread baking, pie making, and dough stretching by a battery of incredibly talented chefs and instructors. These women are the real deal. They will instill supreme confidence in anyone who fears the seemingly precise and unforgiving world of baking, and turn all skeptics into raving flour zealots. I would put a money-back guarantee on it. For my therapy immersion and wake-up call, I needed something simple, a reminder that no matter what sends me reeling, I can still cook, I can still write, and I can still consume large amounts of yeast- and flour-based food. With its quick rising time and opportunity to roll lots of squishy dough bits around in my hands—not to mention its sympatico relationship with a pat of butter—a dinner roll recipe would do. All the usual comforting adjectives apply to these golden orbs: pillowy, soft, fluffy, buttery. These rolls could be the poster child for carbs. 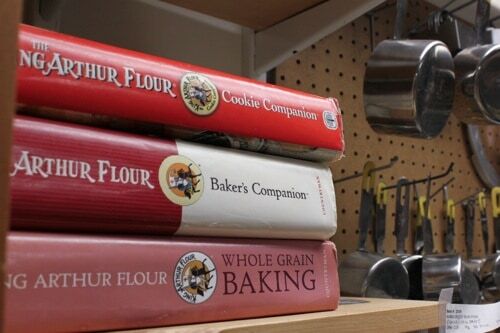 PJ Hamel, the visionary behind the master tome The King Arthur Flour Baker’s Companion and one of the smart cookies who writes for the KAF Baking Banter blog, hit the sweet spot with this recipe. Just a few tweaks made the rolls exactly what I wanted them to be—I reduced the amount of sugar to end up with a more savory dough, I subbed in buttermilk for regular milk because I just can’t resist, and I didn’t bother filling the rolls with any cheese (what?? I know!). If you’re willing to shell out a few bucks for King Arthur’s pizza dough flavor, the few optional tablespoons I’ve added to the recipe make a huge difference. The package says the seasoning is a combination of dried garlic, cheese, and other spices, but I actually think it’s made of magic. In a large bowl, mix the Quick Starter ingredients (yeast, warm water, sugar, and flour) until incorporated and allow to rest for 5 minutes. While the starter rests, measure out 17 oz. (about 4 cups) of the flour in another large bowl, and the additional 4 1/4 oz. (the fifth cup) into a small bowl. Mix the buttermilk, butter, salt, sugar, egg, pizza dough flavor (if using), and 4 cups flour into the starter with a dough scraper or wooden spoon until a soft dough forms. 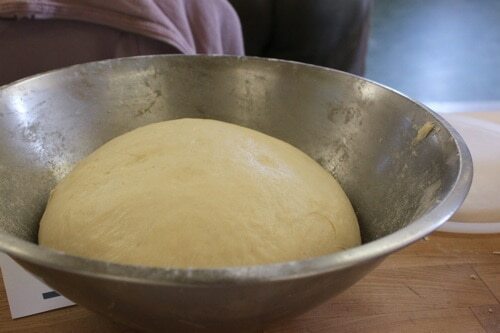 Lightly spritz the clean bowl that held your 4 cups flour with baking spray or rub with canola oil, and add the dough. Cover and let rise for 20 minutes. While the dough rises, line a large baking sheet with parchment paper. Once the dough has completed its 20-minute rise, turn the dough back out on the floured work surface and divide into 16 pieces weighing approximately 2 1/2 oz. each. (Remember, a kitchen scale makes everything easier!) Roll each piece into a smooth ball, pinching the loose ends together on the bottom of the roll, and place on the lined baking sheet. Cover and let rise for 20 more minutes. Preheat the oven to 375 degrees F. Bake the rolls for 15-18 minutes or until golden brown. Transfer to a rack and eat as soon as they’re cool enough to handle. Disclosure: ReadyMade compensated me for attending Blog & Bake, and King Arthur Flour provided lodging and instruction gratis for all attendees.